The Seventh of March Speech was one of the most famous orations delivered by Daniel Webster, an orator who had no equal. Webster had worked magic with his grandiloquence, attracting large crowds to hear him on historic occasions like the anniversary of the Pilgrims' landing. He thought his Seventh of March speech would preserve the union. Not only did it fail, but it cost him the presidency of the United States. 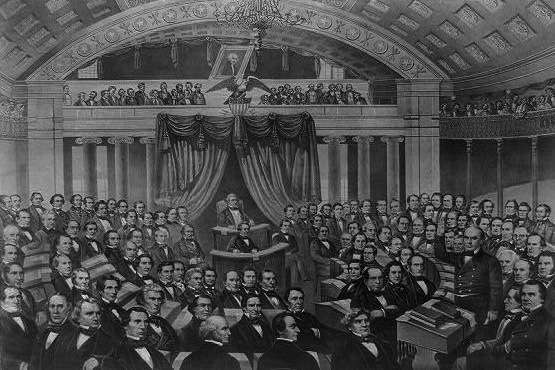 Daniel Webster (lower right) addressing the U.S. Senate on the Seventh of March. Image courtesy Library of Congress. For nearly two decades, Daniel Webster had dominated the courts, the legislature and the public speaking circuit. He was a leader among America’s second generation of statesmen, along with Henry Clay, Stephen Douglas and John C. Calhoun. In early 1850 he intended to rebuke the abolitionists, who he viewed as fanatics and demagogues driving the nation toward a bloody schism. In the Seventh of March speech he argued that slavery had nothing to do with human rights. Instead, he said, it resulted from history, geography, politics and law. He didn't persuade his Massachusetts constituents. In fact, he infuriated them. He had risked his career and his reputation, and he lost. In the beginning of 1850, the South was hurtling toward the frightening crisis of secession. Senators Henry Clay of Kentucky and Stephen Douglas of Illinois were trying to avert the crisis with The Compromise of 1850. The compromise included five bills that resolved the status of territories acquired during the Mexican-American War. Under the compromise, Texas would surrender its claim to New Mexico and California would be admitted as a free state. Washington would ban the slave trade, but Utah and New Mexico would be allowed to decide for themselves whether to be slave or free states. Finally, the Fugitive Slave Act would require government officials in free states and territories to return escaped slaves to their owners. Webster supported the compromise. He feared for the fate of the nation, and he didn't have much time to save it. And at 68 his health was failing. “I am nearly broken down with labor and anxiety,” he wrote. He knew South Carolina Sen. John C. Calhoun intended a speech attacking the compromise in early March. Webster wanted to help bring the moderates together to help Clay and Douglas, and he thought a speech could do it. So did others. His supporters told him he would eclipse George Washington if he could pull it off. One Democrat begged Webster to reconcile the North and South. “Do it, Mr. Webster; as you can do it, like a bold and gifted Statesman and Patriot." Mr. President, I wish to speak today, not as a Massachusetts man, nor as a Northern man, but as an American, and a member of the Senate of the United States. . . . I speak for the preservation of the Union. Hear me for my cause. He spoke for 3-1/2 hours, a relatively short time for Webster, who sometimes went on for five. The Seventh of March speech slammed into Massachusetts like a nor’easter. 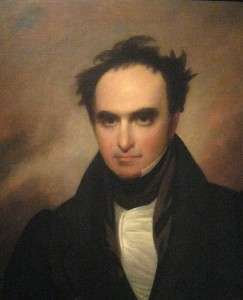 Daniel Webster received swift and harsh condemnation. He especially enraged Massachusetts voters with his support of the Fugitive Slave Act. “The South, in my judgment, is right, “ he had said, “and the North is wrong." "Liberty! Liberty! Pho!” said Ralph Waldo Emerson. “Let Mr. Webster, for decency's sake shut his lips for once and forever on this word. The word 'Liberty' in the mouth of Mr. Webster sounds like the word 'love' in the mouth of a courtesan." Webster fought back against his critics. He had 200,000 copies of the Seventh of March speech printed and ordered them sent to ‘every man that reads the Atlas,’ and to every town in New England, New York, Pennsylvania and Ohio. Webster revised it as The Constitution and the Union (click here for the full text). He supervised the preparation of a letter in his defense signed by 800 prominent Massachusetts men, including Rufus Choate, Oliver Wendell Holmes and George Ticknor. Southerners and Northern moderates received the speech warmly. Several hundred New York businessmen sent him a thank you letter and a gold watch. But the Seventh of March speech finished Daniel Webster’s Senate career. Four months later on July 17, he delivered another speech to the Senate – his farewell speech. He then resumed his position as President Millard Fillmore’s Secretary of State. In 1852, he unsuccessfully sought the Whig nomination for president while suffering from cirrhosis of the liver. Shortly thereafter, he fell off his horse at his home in Marshfield, Mass., crushing his head in the fall. Daniel Webster died on Oct. 24, 1852, after uttering the words, "I still live." With thanks to Daniel Webster: The Man and His Time by Robert Vincent Remini. This story about the Seventh of March speech was updated in 2019.